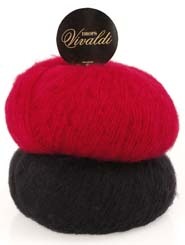 Another popular mohair yarn. It is a fine, soft yarn, and an excellent choice for wraps, scarves and shawls, but also knits up beautifully in jumpers and cardigans. Also ideal for knitting in with another yarn to create a haze of mohair, or to provide edging for garments. Handwash, iron on medium heat. Do not bleach or tumble dry. Can be dry cleaned. For free patterns for Vivaldi, visit www.garnstudio.com.